The futuristic warship will become operational by 2025, and will most likely be equipped with the Caliber cruise missile system and the Prometheus ZRK (anti-aircraft surface-to-air missile system). Work on the ship has been entrusted to the Northern Design Bureau, the creator of practically all of the major surface warships in the Russian Navy. Although work on the design of the ship will start in 2015, the construction of the first of the series of 12 ships – half a dozen for the Northern and Pacific fleets – is not expected before 2023-2025. Naval officials had said that the construction of the destroyer would commence in 2012 and two years ago representatives of the United Shipbuilding Corporation pushed that to 2016. The Leader program is not believed to have been included in the state armaments program for 2020 and funds for the construction of destroyers may only be dispersed within the framework of the shipbuilding program planned out through 2050. “The decision to change the date for the creation of Leader type destroyers to 2023-2025 was completely justified,” independent military-naval expert Alexander Mozgovoy told RIR. “First of all, the Russian shipbuilding industry simply cannot build such ships at the moment,” he added. “Secondly, immense sums of money are needed to implement the program, but this money can currently be put to great use in other areas.” The analyst said some of the armaments systems meant for the Leader exist only “on paper” at the moment. It is believed that the main attack method for the Leader will be the Calibre integrated missile system which is exported under the name Klub and includes 3M-14 anti-ship and cruise missiles. These are designed for the destruction of important targets at great distances deep in the territory of the enemy and are recognized as going to be the “long arm” of the destroyer. In addition, the Calibre has anti-submarine missiles that make it possible to efficiently destroy various submarines belonging to the enemy, including silent non-nuclear subs. The destroyer’s second “long arm” may be the Onyx strike system with supersonic cruise missiles. Moreover, both the Calibre and the Onyx can be used from the same launching unit. This is the main specificity giving Russian battleships full versatility and real multi-tasking capabilities. A version meant for ships of the unique S-500 Prometheus anti-aircraft missile system will guarantee protection from air attacks. The ship will also get medium and close-range air and missile defence systems. In addition, artillery and mine-torpedo equipment – means for fighting with saboteurs, helicopters, and drones – will be installed on the Leader, as well as modern radar and sonar which will allow the destroyer’s crew to detect any air, water surface, or underwater targets, even small or inconspicuous ones, at distances of tens, even hundreds of kilometres. However, what exactly the Leader’s armaments are to be is not yet known. Moreover, there are weapons systems still in the development stage which will only be available for use in the fleet after several years. In particular, the then First Deputy Defence Minister Vladimir Popovkin spoke in 2011 of work on the creation of the Zircon-S ship-based hypersonic missile system. “At the R&D stage, the ministry will conclusively determine which is more appropriate, a nuclear or conventional destroyer, or whether it should be both. The latter variant is totally possible,” a highly placed source in the Russian military-industrial complex told Tass. 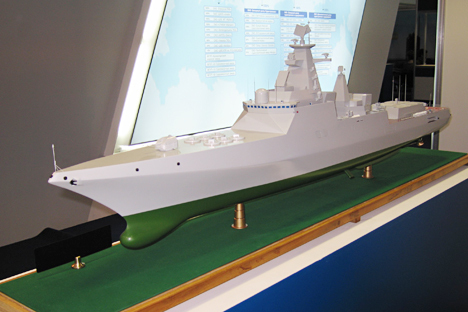 Considering the current capacities of domestic shipbuilding, today’s complicated financial and economic situation, and fact that the surface water strength of the Russian fleet requires large-scale and rapid renewal, the Ministry of Defence may not be in a position to construct destroyers with two types of power-generation units. Such production in midget batches – six nuclear and six gas turbine ships- is also unlikely. At the moment, not even the world’s “richest” fleet, the U.S. Navy can dream of something like this! “Resuming a permanent presence on the world’s oceans should make a hole in the Russian budget,” executive editor of the Independent Military Review, Oleg Vladykin told RIR.